Please join us for our launch of the CITRIS Silicon Valley Forum 2018 while we share our innovative, cross-disciplinary research with the broader community. 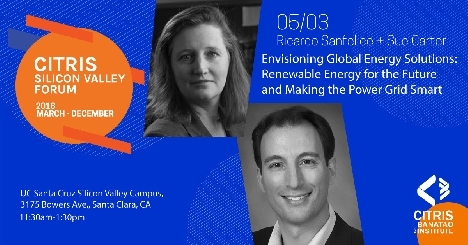 Our third panel of the Spring 2018 series invites Ricardo Sanfelice, Associate Professor of Computer Engineering and Director of Cyber-Physical Systems Research Center at UC Santa Cruz and Sue Carter, Professor at the Physics Department at UC Santa Cruz to highlight crucial innovations and trends in Smart Energy. Our third Silicon Valley Forum discussion will focus on new innovative happenings on the subject of Envisioning Global Energy Solutions: Renewable Energy for the Future and Making the Power Grid Smart. Topics will include smart grids, renewables, algorithms in the context of cyber-physical systems, and renewable energy solutions at the food/water/energy nexus. Topics will focus on both urban and rural/developing systems. The panel will take place on May 3, 2018, from 11:30am-1:30 pm. The discussion will start promptly at 12 pm, to allow people to arrive and network before. This event will be hosted at the UC Santa Cruz Silicon Valley campus in Santa Clara, CA. Lunch will be provided.